Give your vehicle's front end a unique and custom look. 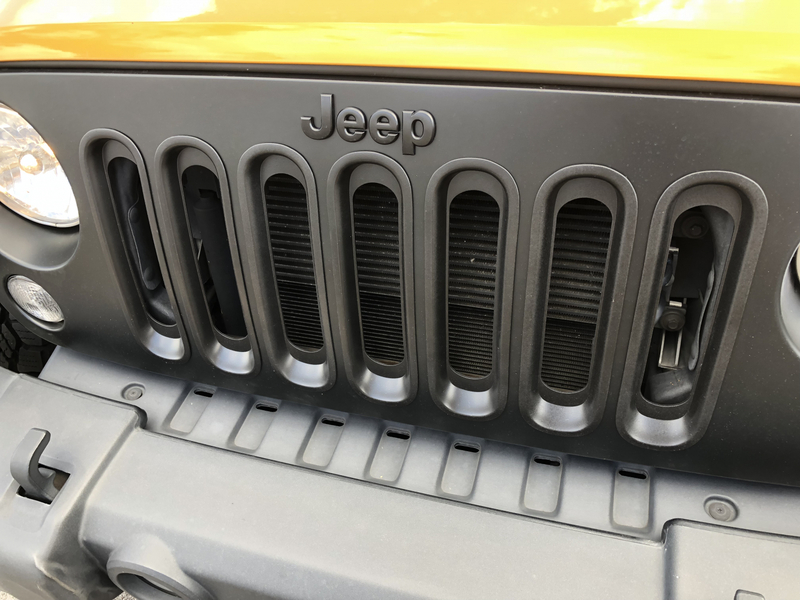 Upgraded grilles and front end appliques help enhance vehicles aesthetic appeal. 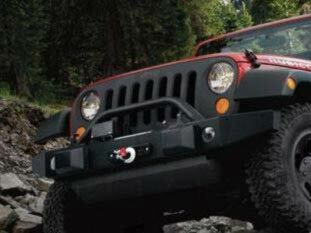 All parts are designed to meet Jeep's standards for durability. Satin Black (RXF) Grille, exact replacement for production painted grille. Black Jeep badge is included on grill. The hardest part of install was figuring how to remove the 6 clips that attach OE grill. The included Mopar instructions require a special tool. I used two standard screw drivers to evenly lift clips. Once I figured that out had old removed and new installed within minutes. I showed my wife when I was done, she said it must be a guy thing. No it's a Jeep Thing! Was very easy to install. The original grill is just held on by spring clips and fasteners at the top. I think it took more time taking off the old then putting on the new grille. ProsWas able to add my existing grille inserts which makes it look even better. Easy to install, fits perfectly. All parts were included and grill was received quickly and in perfect shape (no scratches). Changed from stock grill that had cracked to black satin grill. Looks awesome. Took less than an hour to install, longer than usual only because we had to adjust front bumper. Everything I was hoping for. Installation was quick and easy, couldnt be happier with my purchase! Could not be happier with this new black grill, easy install & looks great. ProsLooks great on my 2016 white sahara! The price couldn't be beat and the order went in with out a hitch. The shipping took quite a while, apparently due to a damaged grill in the warehouse. . The issue I had was that no one informed me that the item would be late due to the issue. It wasn't until I called to see why it wasn't there a week later did I get the update/reason. Polite and helpful on the phone. I was just disappointed with the lack of communication. The grill itself is perfect and looks amazing. Extremely happy with the purchase. ProsLooks amazing. Installation was an absolute breeze. Very easy install, took 10 minutes. Looks great, much better than plastidip or a cheap aftermarket grill. 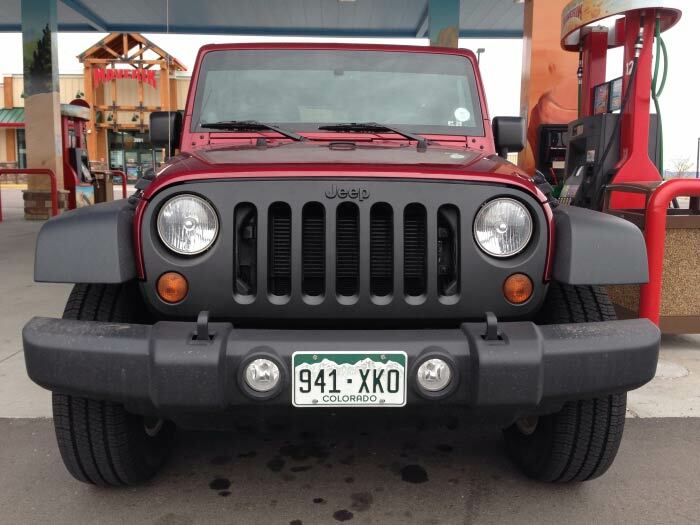 The grill looks outstanding on my Jeep and is OEM quality. The trick is getting one that is not damaged. I have had bad luck with Mopar accessories being damaged in shipment due to poor packaging design on Mopar's part. Luckily JustForJeeps stood behind the product they sell and let me exchange the damaged one that I had received. 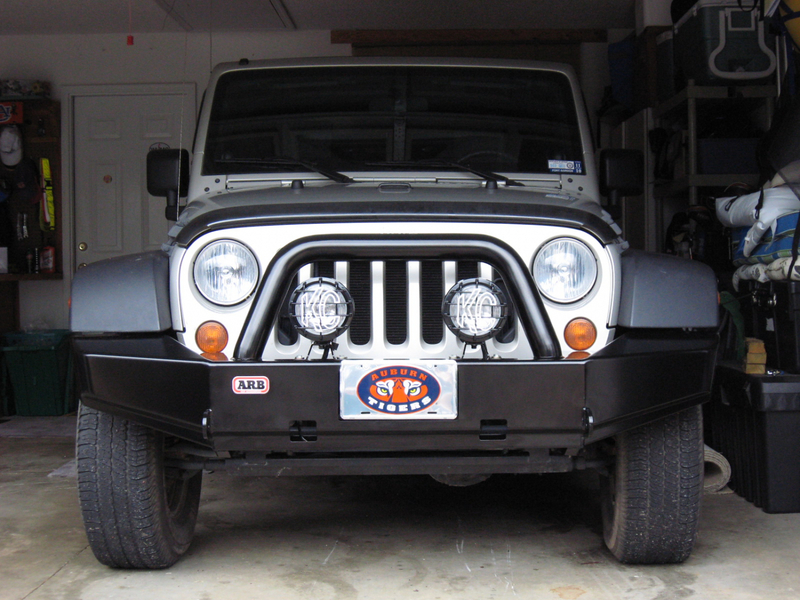 Would recommend JustForJeeps as well as the Mopar Satin Grill. Looks great and took only a few minutes to install. Great item, super easy install - took 10 minutes. Shipping box now holds original grille for storage. Grill fit perfect with a quick install. Fast shipping from "Just for Jeeps". Great product, prompt delivery. The install was extremely simple. Just remove your old grill, push out the turn signal housings and install in new grill. Once new grill is installed I placed the old grill on bumper in front of the new grill so it was easy to line up the rubber weather strip that adheres to the top of your new grill. It's a simple peel and stick with 3M tape. The satin finish is in between a matte and a gloss, has a smooth, dull look. Jeep emblem was perfectly placed and blacked out. Solid item at a fair price point. So happy to have found it because the backorder for a Grill is in the negatives at the dealership! This one is just as my son wanted and for an AWESOME price! Shipping was quick too! Thank you, it looks really good on his Jeep. I have a white jeep and I have been looking for a black grill. This is the only one I could find that actually had Jeep imprinted on the front of it. It looks great and was a snap to install. I cannot say enough times what a pleasure it is to deal with this company. Prompt service and above and beyond customer service. I received immediate replies to my questions. I got my item carefully packaged and very quickly. He even went so far as to find a part for me. Definitely my first stop shop. First the item was offered at a stellar price with free shipping as well. Additionally it was 100% Mopar and condition was NEW as described. IT DID Arrive quickly via UPS delivery and in 100% PERFECT first class condition. 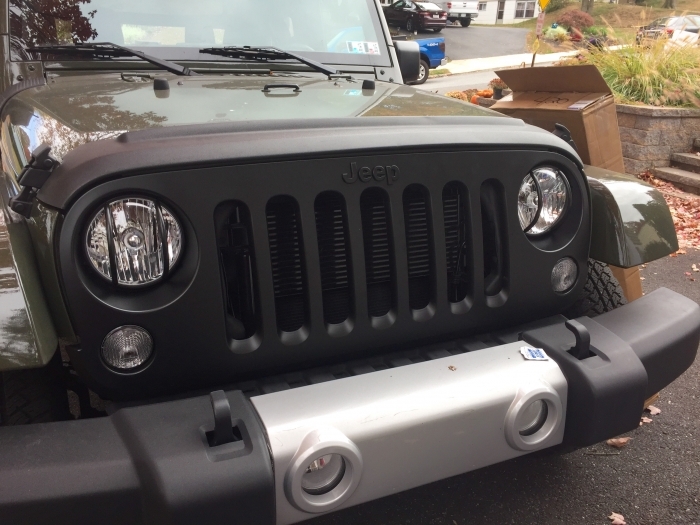 The install is easy and quick following the included directions, one does after removing their old grill, switch out the Jeep parking turn signals from old grill, then install both parking/turn signal lights back in to this new grill, this whole process takes about 5 minutes. Also one will have to install the weatherstrip (prevents moisture from entering engine bay, is positioned on top of new grill and is sealed with closure of hood, review it on your old grill, just follow directions here, lining up the weatherstrip on the new grill adjusting while removing doublesided tape, this again probably only takes about another 5-10 minutes, realize once taped in place it is not going to come off, so be sure of your process and alignment plans before starting this procedure and don't pull and stretch it. If the weatherstrip is bent set it out in sun for a few more minutes first and the bend will be corrected, prob should not install it with a "bend" --just another issue you have to deal with in its alignment. 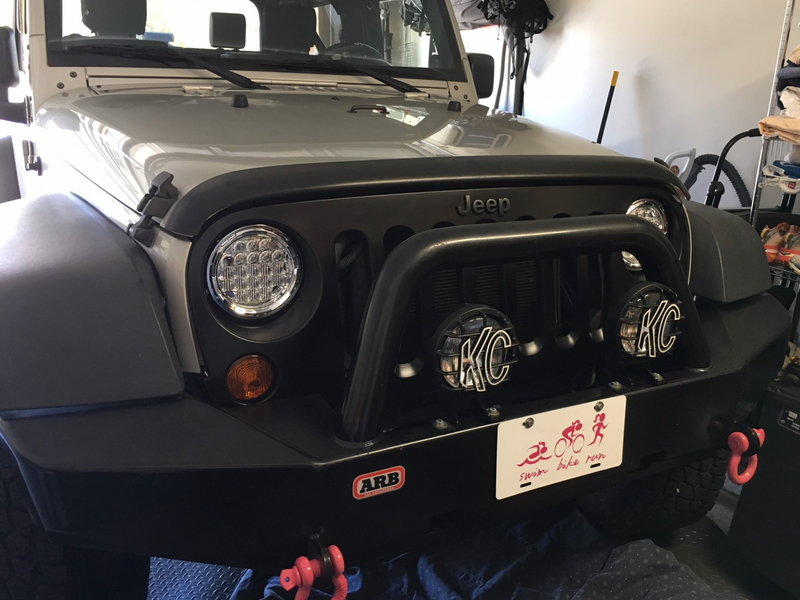 This Satin Black Grill will Totally change the dynamic look of your Jeep, especially like the blackened out "Jeep" emblem as well, Jeep emblem is perfectly aligned already arriving installed on this grill. ProsMopar quality and warranty, Mopar perfect fit replacement and 100% designed for their Jeep vehicle. Consnone apparent, probably would suggest the weatherstrip be installed as is the Jeep emblem, but not a huge issue, must study the instructions a bit they are sign language, and use arrows to indicate what you are to do, all fine but may want to go a bit slow at first.